Netherlands On June 17, 2002, the Netherlands also committed itself to the JSF’s system development and demonstration (SDD) phase by exchanging with the Department of Defense memorandum of understanding (MOU) documents. These MOU documents were signed on June 5, 2002, on behalf of the Dutch Cabinet at Soesterberg Airbase (NL) with the Under Secretary of Defense for Acquisition, Technology and Logistics countersigning the MOU documents in Washington, D.C. on June 10, 2002. As a result, the Netherlands will invest $800 million [ 848 million] in the SDD effort. The Netherlands has been part of the JSF program since 1997. 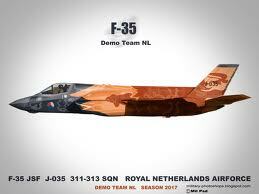 The Netherlands became the fourth country to join as a JSF SDD phase partner, and the first ‘Level 2′ partner. The Dutch commitment spans ten years. For the previous two and a half years, the Netherlands had conducted a rigorous technical and financial analysis of potential candidates to replace its F-16s. In both assessments, the JSF ranked first. The Netherlands selected the U.S. plane as the best candidate to replace 85 older aircraft in December 2008. Posted on March 8, 2013, in Aviation. Bookmark the permalink. 1 Comment. out from Humble Tx! Just wanted to say keep up the good job!